Reserve 1 tbsp flour for coating chocolate chip and almond. In a large bowl, sift together flour, sugar, baking powder and salt. In a separate bowl, combine egg, milk and veggie oil. Stir liquid into dry ingredients with a fork until just moistened. About 10 to 15 strokes would do. Stir in the chocolate chip and almond strips. Do not overmix. Spoon batter into muffin cups slightly more than half. Bake in a preheated oven 180 deg C for 25 – 30 minutes. 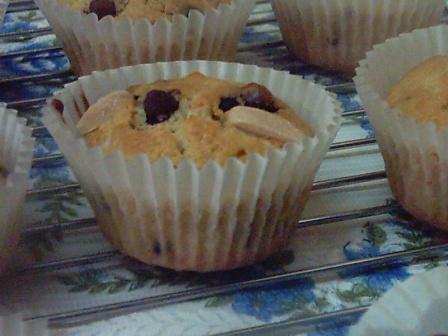 This entry was posted in Cakes & Muffin and tagged choco chips muffin. Bookmark the permalink. Ni kalau budak-budak mesti suka ni..